Animal Crossing New Leaf is one of the best video games ever made. Notice how I didn’t say “one of my favourites.” No, this game is, in my opinion, one of the greatest video games ever created. I say this with no hyperbole. Animal Crossing doesn’t have the best gameplay ever. Animal Crossing doesn’t have the best story ever, hell, it doesn’t really have one at all. Animal Crossing isn’t even the most innovative game series ever. But Animal Crossing evokes something. Animal Crossing makes you feel something that other games can’t do. Everything about the game is designed around the one goal: The evoke comfort and safety in the player. All the gameplay mechanics and systems aren’t made to test the player’s abilities, but rather, to invoke relaxation. This may sound fairly silly, as many other alternatives can provide comfort and relaxation. Family, good times with friends, calm music, all of this can do the job. Well, not quite. Animal Crossing evokes a particularly special kind of comfort and escapism. There are tons of subtle factors that make Animal Crossing different from these specific types of escapism. SO LET’S OUTLINE THEM, SHALL WE? Animal Crossing OST’s are as simple as they get. They are peaceful, 1-2 minute loops with very few instruments. Each in-game hour has a different track to evoke a mood you’re meant to feel. 4PM will have an upbeat tempo to keep you motivated throughout the day, while 1AM will have a very slow, mellow tune to evoke relaxation and stillness. On their own, many of these songs aren’t exactly what you’d listen to on transit or in your car, but as atmospheric, supplemental music to another task, it works phenomenally. But other game’s have relaxing soundtracks, what makes these so special? Well, their simplicity lends to the theme of innocence permeating throughout Animal Crossing. None of the songs are bombastic or take you by surprise. All of the songs suggest positive, wholesome themes like happiness, openness, and humility. I know it sounds weird to read this, but Animal Crossing’s soundtrack is focused towards specific goals and evoking specific emotions. In high school, for example, if I had a really stressful day and needed to unwind when I got home, Animal Crossing was the perfect coping mechanism. I would always usually open it up around 4PM, hear the upbeat, simple jingle, and begin my daily routine. I would organize my home, talk to my villagers, see the daily catalogues, and my mind would clear. See, I also had a pretty nasty medical condition where I would get headaches frequently. High School would amplify these headaches greatly, and they would often be debilitating. But, popping in headphones, hearing the calming tracks at any time of the day, and just, relaxing always cleared my head. It was more potent than Advil or any drug. Parents, if you want your children to stay away from alcohol or drugs, just give them Animal Crossing. It works wonders. Each track also evokes a feeling you generally feel during the time of day. Regardless of whether or not you’re a night owl or not, at 4AM, anybody can relate to the feeling of horror or chills. Like, in the still night, that there can be somebody watching you, ready to kill. This song exemplifies that feeling. 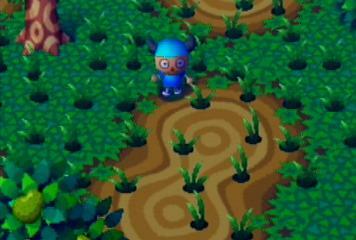 It’s 4AM, none of your villagers are awake, all stores are closed, nothing is running. So, why are you awake? The game is reflecting your isolation, your paranoia, your fear. I’ve even had friends come up to me and say Animal Crossing’s music reflects their emotions incredibly well. It helped them with their depression and loneliness by showing those complicated topics in an easily digestible form. Loneliness manifested within a video game, and I think that, for a soundtrack to have that power, is incredible. How does no story make Animal Crossing a great game? What’s the point to keep you going? Goals. Small goals, big goals, inconceivable goals, or nothing at all. Animal Crossing drops you into a town, it gives you a small house and some tasks, and you’re expected to pay it off. Only, you don’t have a time limit to pay this off. 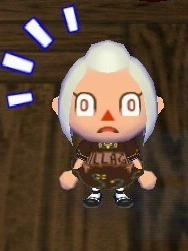 You can go say hello to your fellow villagers, visit Tom Nook’s store or the Mabel Sisters to design a new shirt or hat. It’s all very cute and wholesome. There are no pressures or deadlines, but rather, goals that the player sets at their own pace. You could develop a daily routine and schedule, you could meet with friends locally and online, you could do whatever you wanted, whenever. That type of freedom allows for player-driven stories, and a variety of motivations to be acknowledged. Some people may wish to become the best mayor, designing projects and funding their creation for the most beautiful, luxurious town there is. Some people become designers, and post their designs on Pinterest and Tumblr. Due to the immense customization for designs, some of these are fantastic. My personal story when I used to play Animal Crossing was to make as much money as possible. I still remember getting excited catching sharks and barred knifejaws, and getting depressed at the bombardment of Sea Bass. I wasn’t into catching bugs because it never made me much money. I was really uncreative, so I never bothered to theme or customize my house. I just got varieties of furniture that “looked cool” to a 10-year-old. I concerned myself with a specific goal, and I had fun doing it. Animal Crossing has the systems in place to facilitate desires. There are no consequences for not pursing a different goal. If you want to live in the smallest house and resist the capitalist regime, then go for it. Go catch butterflies, you don’t need to eat food in this world. The world is uh, ending. But these are just silly stories I made when I was a kid. When I got older and picked up New Leaf, I ditched away those old habits and made it essential to experience the game with friends. We would visit each others towns, give gifts, and try to improve everything. It was like we were a team making our town’s the best they could be! Anybody’s journey in Animal Crossing is their own, since it is so peaceful and open. Let me know if you have any of your own personal stories as well. Animal Crossing would be an incredibly lonely experience if it weren’t for the characters residing in it. I can only handle fishing and bug catching on my own for so long before I need some social interaction. Thankfully, the plethora of villagers who move into your town add a lot of necessary breaks and tasks to a day. I’m a big fan of villagers providing you daily tasks, as it keeps incentivizing the player to return for more Animal Crossing. Although I am not a fan of these villagers trying to swindle me into stupid deals. Believe it or not, a shark for a pear is not a fair deal. Please stop trying to convince me otherwise. Each villager has their own personality and unique appearance too, so you can get a multitude of responses that personalize your town. The best part, is that none of the villagers pressure you into anything. They just mind their own business, and if you feel like talking to them, they’re open to conversation. Sure, they don’t work or contribute to the town’s economy, but, they don’t talk to me when I don’t want them to, so it balances out. Then just get out of there. But the villagers’ lack of initiative plays into the theme of comfort and relaxation. Nothing comes at you in the game like it’s an absolute necessity. When I play Stardew Valley, there are a lot of timed systems that require stressful planning and time management. Animal Crossing’s town members don’t follow a strict schedule, and they can often be found relaxing in their homes. And when villagers are set on a specific schedule, it never changes depending on the day. They go to bed at realistic times and they are available at any other time. It isn’t different if it’s raining or a different day of the week, and you don’t need to religiously follow a guide to find villagers. They are there when you need support, not a burden on you. So who’s my favourite villager? Animal Crossing very rarely utilizes deadlines for tasks. This is because deadlines naturally create stress, and Animal Crossing does not want you to feel like you’re doing a job. If a deadline is given, it’s usually a fairly simple task with a generous amount of time. You have 10, real life hours to talk to an NPC and deliver them a shirt. Fail to do this, and you get slightly reprimanded. There is no consequence, but there is a benefit if you seek it. There’s no morally ambiguous “IF YOU DON’T DO THIS, THIS CHARACTER WILL DIE” bullcrap. Some people dislike the lack of conseuqences, but remember, everything in this game is here to be peaceful and wholesome. This is a deliberate decision to ensure that players are always welcome at any time of the day. My personal favourite aspect of the real-life clock system is how well it mirrors real life surroundings. When I’m huddled under my blanket at 1 in the morning on a freezing winter day, and I see that experience translated into video game form, I create a connection with it. I feel comforted and nostalgic by what I see. When it’s 8PM on a summer day, and I see the sun setting slightly, it warms my heart. It’s a nostalgic sight, because the fantasy of a video game lets me fantasize about great memories in the past. If I can’t go outside and experience these memories at the moment, Animal Crossing provides that alternative. It’s a comforting world that reflects reality, but with talking bears and hedgehogs. But, really, these changes are minimal. Animal Crossing lets you pick up right where you left off with minimal effort. It doesn’t really discourage you going away from the game. It’s just a light slap on the wrist. It lets you know that a lot of time has passed. Even the villagers remark on how long you have been gone for, and they say that they missed you. It’s nice, knowing that there are people there to return to. As obnoxious as the villagers can be sometimes, they’re always supportive and friendly. They aren’t doing anything terrible. Animal Crossing is always waiting for you, but not in a creepy way. Animal Crossing welcomes anybody with open arms, and the glut of positive fanart and happy community it has formed in the gaming world is testament to that. Seriously, you won’t find people more wholesome than the Animal Crossing community. It’s a game that breeds cooperations and family, and that is reflected in the positivity it exudes. That’s why Animal Crossing New Leaf is one of the best video games ever.